It is the last Sunday of the Church Year, often called Christ the King Sunday. The other years of the lectionary that typically means an eschatological parable like the 10 virgins trimming their wicks. When we are in Luke, it means Good Friday. Luke’s Good Friday scene is unique because there is a divergence from the other Gospels. One criminal sees something that the others don’t. The world is united in seeing “This is the King of the Jews” placed above Jesus as a great joke. One naked criminal sees the King. One naked criminal sees His Grace. It is like all acts of God – hidden and revealed. It is done plainly before all the world, yet it is faith alone that perceives the revelation. To those without God’s acts remain hidden. The sermon is a meditation on this and what we see – mistaken peasant or King. Worship note: The text drives some different hymns than normal. The opening hymn was “The Head the Once was Crowned With Thorns”, but I’ve left in the Hymn of the Day. LSB 534, Lord, Enthroned in Heavenly Splendor. The tune right after the alleluias is tough, but the words uniquely to me capture the day’s theme. The cross as throne, the acts of God hidden in humble frame. The last Sunday of the Church year (today) is often called Christ the King Sunday. The appointed reading from Luke is the crucifixion. I usually dodge preaching directly on this text. For those who have been around Holy Week at St. Mark’s, Good Friday has been our collective reading of the passion text. We let the gospel preach itself in our midst. If you can’t be moved by the text itself…what am I going to say. I couldn’t dodge it today, but today compared to Good Friday the purpose is slightly different. Good Friday is more about the lens of atonement – the cross as what buys our salvation. Christ the King is about the revelation of the God. 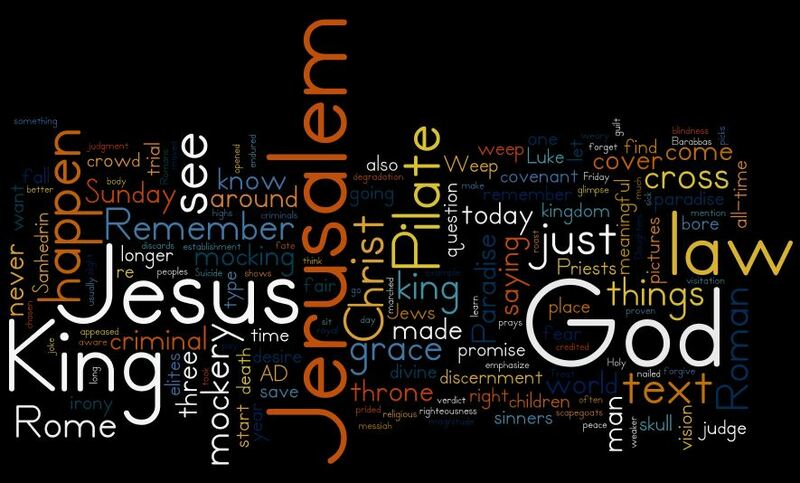 When we say Jesus is Lord, what kind of King or Lord do we have. 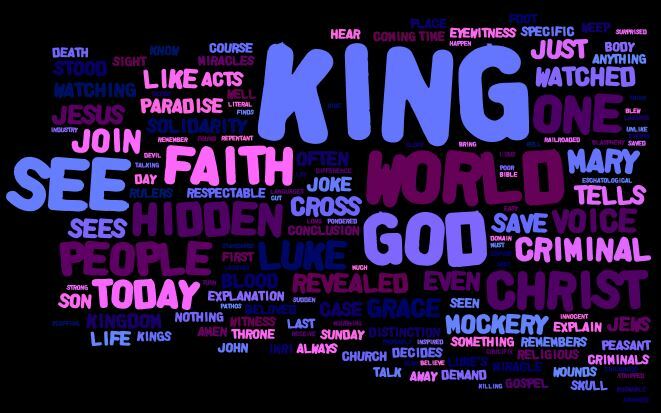 It is that word – King – that the text can tell us about. “There was also an inscription over him, ‘This is the King of the Jews’”. It is here, at the place of the skull, we are to see most clearly, to learn the type of King we have. This sermon looks at the text and application to our knowledge and lives through looking at three pictures that are concluded by memorable phrases of the gospel. 1)	For if they do these things when the wood is green, what will happen when it is dry. 2)	The mocking contrasted with the criminal’s – “remember me when you come into your kingdom”. So, what what this sermon does is invite you to ponder three pictures or three phrases.